When Everything Feels Like the Movies is the story of Jude, a flamboyant gender-bending gay teenager suffocating in a small bleak mining town. His mother is a stripper, his mother's boyfriend is a hard-drinking homophobic brute, and his best (and only) friend is sleeping her way through the entire male population of their high school. Jude faces the expected bullying with a mixture of nose-thumbing and a self-destructive embrace. He plans to escape to Hollywood, where he will become wildly famous and infamously lusted after. This book has courted a lot of controversy. 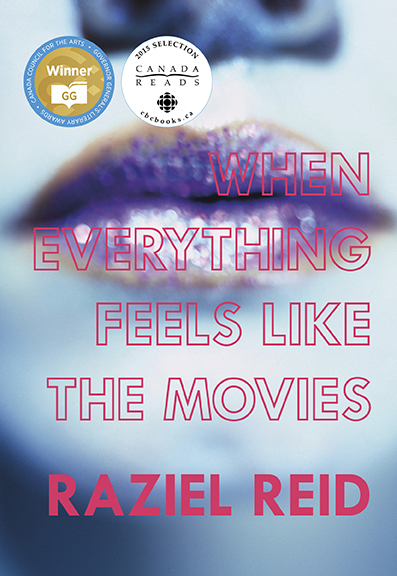 As a finalist in this year's Canada Reads competition, its inclusion was hotly debated, not just because it was the first Young Adult novel to be included, but because it is such a sexually explicit YA novel. Personally I had no problems with the explicit sexual depictions, but they are relentless, even for a story told from the POV of a raging teenager. I did, however, have some other problems with the book. Jude's outlook on life is, frankly, dead shallow. I wanted to root for him more than I did, but his obsession with appearances and instant gratification made him more frustrating than sympathetic. That too, I suppose, could be attributed to his being a teenager and all. As could his insistence on indulging in the same self-destructive behaviours over and over again. Those are all somewhat realistic character flaws. My main problem was that of voice. Near the end of the novel, something happens that makes it impossible for the book to continue in the same narrative. Yet continue in that narrative it does. I found that very glaring and I wasn't able to entirely suspend my disbelief. Despite its flaws, though, When Everything Feels Like the Movies is a novel worth reading. Because ain't none of us perfect. Thanks for the review ~ cheers! p.s. YA novels ~ Julie Murphy, former co-worker at the library here, now has a #1 NY Times YA novel, 'Dumplin'. She gave a talk here recently and it was neato ~! Well done to Julie! Thanks for the alert, Erik; I am going to look for your former coworker's book.